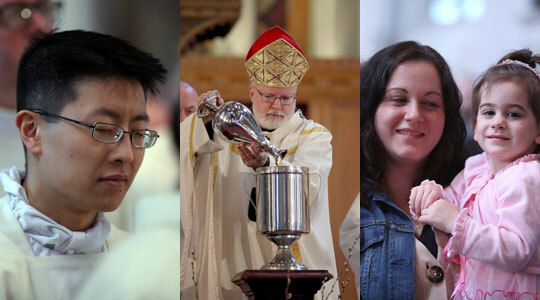 Summary of today’s show: On Tuesday of Holy Week in the Archdiocese of Boston, Cardinal Seán celebrates the Chrism Mass with the priests of the archdiocese, blessing the holy oils used in sacraments for the next year and renewing their priestly vows. In a special broadcast from the Cathedral of the Holy Cross in Boston, Scot Landry and Fr. Chris O’Connor, first, discuss the Mass and Holy Week with Fr. Jonathan Gaspar and the listen to and reflect upon Cardinal Seán’s homily to the priests, which each year is the one he prepares for with the greatest reflection and prayer. 1st segment: Today the show is being broadcast from the Cathedral of the Holy Cross following the celebration of the Chrism Mass. He is joined by Fr. Jonathan Gaspar and Fr. Chris O’Connor. Fr. Jonathan said it’s always great to see so many priests turn out. Fr. Chris said many priests make a conscious decision to come from all over the Archdiocese in order to receive the oils used in sacraments and to renew their priestly vows. Many can’t come because they are needed in their parishes. Scot said it seems the Cardinal puts extra time and effort into his Chrism Mass homily. Fr. Jonathan said the Cardinal loves to preach, but he spends a great of time preparing for this one in particular, offering the priests a message of hope and encouragement. He said the Cardinal has spent many nights over the past few weeks in prayer before the Blessed Sacrament and at his desk writing his homily. Scot said Cardinal Sean said the Chrism Mass is a sign of unity across the archdiocese in the sacred chrism consecrated today to be used in every sacrament of baptism, confirmation, and anointing. Fr. Chris said all of those sacraments are connected to this Mass today. Another element of unity is the presence of Greek Orthodox Metropolitan Methodios. Both the Metropolitan and the Cardinal spoke of the need for Christian unity. Scot said there is a luncheon for priests after the Mass at the cathedral and each year two priests received awards for their service. Fr. Jim Rafferty and Fr. Dave Palmieri were the recipients this year. Scot noted that Fr. Rafferty received unfavorable press coverage for a pastoral decision a few years ago at St. Paul’s in Hingham and this was a chance to highlight his service and to reaffirm him as one who preaches the faith in season and out of season. Scot said Cardinal Seán also mentioned during his homily how many priests tell him they first had an inkling of their vocation from their childhood priests who mentioned the possibility for the call in their lives. Fr. Jonathan recalled his own childhood priest who planted the idea of a vocation in him as a boy. He said Cardinal Seán told priests that the first way to foster vocations was to just smile and show the joy of the priesthood. 2nd segment: Scot said the Chrism Mass is the second big event of Holy Week after Palm Sunday. In many places, Chrism Mass is on Holy Thursday morning, but in big dioceses they move it to another day because priests need to get back to the parishes for Holy Thursday evening for all the preparations that must be made. Fr. Chris said in Rome it will be held on Holy Thursday. He said Pope John Paul II used to publish a Holy Thursday letter to the priests of the world giving them something to reflect on. He’s hoping Pope Benedict issues such a letter this year. Scot said priests at this Mass renew their priestly promises from ordination. After 14 years as a priest, Fr. Chris reflected on the renewal and he recalled the words, “Lord, I am unworthy.” In the midst of our own brokenness, Christ continues to call us to minister to his people. It also brought him back to his ordination day, being with his brother priests and celebrating the gift of his priesthood. The only large gathering of priests for Mass like this is the ordination Mass. The Cardinal asked three questions of the priests to renew their priestly vows. Fr. Chris said the Cardinal also asked the priests to pray him as a priestly leader. At another point, the vicar general kepis up and reads the names of all the priests who have died in the past year. About 25 priests were named this year. Scot said he reflected on how every priest present knew that one day their name would be read in this Mass. Fr. Chris said all Christians need to be cognizant of their own mortality and death, but the proximity of Easter reminds us of the promise of eternal life. Once I was visited by a priest who was very discouraged. He thought he was a redhead… He said: “Bishop, I am the worst priest in the world.” I said to him, that is quite a distinction. I asked him about his ordination and first mass. I said, “Did you fight over who was going to be first in line at your ordination? Did you betray Christ for the collection? Did you chop off someone’s ears with a machete? Did you then run away and hide? I was of course comparing the worst priest in the world with the first priests in the world, the apostles. The vocation of the apostles begins with the joyful discovery of Christ, and with the reckless abandoning of their boats, their nets and their families, to follow the Lord. It wasn’t too long however, when they were soon in competition with each other and worried about their retirement benefits, like who was going to have the thrones on the right and the left. To me one of the most poignant scenes in the Gospels is the apparition of the Risen Lord on Easter to the 11 remaining apostles. They’re hiding out in the Cenacle with the doors bolted. Suddenly, Christ is in their midst showing them his wounded hands as if to say: “See how much I love you.” The reaction of the apostles certainly must have been one of very conflicted emotions. First of all, they were overjoyed to see that Jesus was alive and in their midst. Secondly, they would have felt a profound shame and embarrassment because of their cowardly behavior. The apostles did not surface even to bury Jesus’ body after the crucifixion. Had it not been for Nicodemus and Joseph of Arimathea, Jesus’ body would have been cast into a common ditch to be savaged by vultures and dogs. But Jesus’ love and forgiveness is so great, He does not even remind them of how badly they have behaved, but instead gives them the gift of the Spirit so that these sinners could become wounded healers. Scot said one the ideas that stood out to him was that the people entrusted by Jesus to spread the Gospel were not those who had the courage to follow the Way of the Cross and stand at the foot of the Cross. Fr. Chris said we only know for sure that the Virgin Mary and John the beloved apostle were there. He loved how he picked up on the flaws and foibles of the apostles because it shows that by Christ picking these flawed men we see that the Church’s ministry is about reconciliation. He reconciles them to himself in order to send them out to tell about the power of forgiveness. Scot said the cardinal has immense satisfaction that the Gospels give us a gritty, real, intense view of the apostles. Our Church is a hospital for sinners, not a museum of saints. Fr. Chris said it goes back to the incarnation, that Christ became human so we might become divine. Christ is present to us and offering us an opportunity to die to self, so we might live in him. That’s what he calls us all to, regardless of state in life. Scot said although priests today haven’t walked with Jesus in Galilee, they have received the same Spirit the apostles did on Pentecost. Christ is counting on these priests just as He did on the apostles. Scot said the Cardinal has a passion for gathering the people of God around the Eucharistic table each week, because it is where we show our love for one another. Fr. Chris said the early Christians did this to show their love for Christ. There is an equality at that table. All are invited and equal in the eyes of God. We receive communion, we are brought deeper into the mystery of God and are meant to share it with our brothers and sisters in the faith. Scot said Cardinal Seán later told the priests to open the door of faith to people and how grateful he is to his family for opening the door of faith to him. We are all called to show people the beauty of our faith in our lives. Fr. Chris said we learn by imitation and example and so when we see the example of those who love the Lord and willingly give their life in service to the Lord we see the love for Christ conveyed and that faith is infectious. The Chrism Mass allows us to glimpse the grace of belonging to a presbyterate. It is this in this presbyterate, united to Christ and one another that the gifts that we received by the imposition of hands can be stirred up and enlivened. Here all of our struggles and triumphs are melded into one. The hidden sacrifices heroically made by some of our brothers, the special graces, the pastoral genius, the tireless dedication come together to forge our presbyterate. We are a body that together regenerates itself. Together we share the responsibility to announce the Gospel and to build up the Christian community. Scot said this was news to him about faith and belief in the Bible. It’s important for the growth of the Church to understand that faith and belief are fundamental. Fr. Chris said we have to remember that faith is a gift from God to us, which we can accept or reject. It’s also important to remember how grateful the Cardinal was that his parents were believers that they imparted their faith to him. How grateful we should be to those in our lives who have imparted the faith to us. Sometimes when we’re lacking faith, the best way to grow in faith is to tell the Lord and then to pray. We become a better athlete by practicing the motions of the sport, and we grow in faith by acting in faith. Scot said the Cardinal said our faith grows stronger as we share it with others. We all have a huge responsibility to preach the Gospel in season and out of season. Fr. Chris quoted the First Letter of Peter, “be prepared to give a reason for your hope,” for why we believe. What are the highlights of our own faith conveyed in 3 minutes that we would give to someone who asked? Scot said when he lived in Rome, he never saw the church the Cardinal referred to. Fr. Chris said he is going to Rome this summer and he’s planning to check it out. Scot said the Cardinal seemed to be saying that we should tear down anything distracting us from the faith and in its place to lift high the Cross. But the cross isn’t about grief. The cardinal referred to Cardinal Dolan speaking of the joy of having received the Good News and letting it permeate out hearts, even before the cross. Fr. Chris quoted St. Theresa of Avila: “Lord, save me from long-faced saints.” We should see the cross as something beautiful and life-giving. Showing the joy of the love of Christ attracts people and is an invitation to the gift of faith. Scot said in the seminary it’s important to remind the seminarians that formation doesn’t end with ordination. Fr. Chris said none of us are finished products. The disciples on the road to Emmaus were on a journey and each priest has to grow theologically and pastorally. He said he was intrigued by the list of challenges the Cardinal gives each year to the priests for them to work on. It’s helpful to look on all of them and see where they’ve grown. One year is was about working on homilies. Another year was about taking a serious renewing retreat each year. Another year, they were to form a spiritual fraternity. This year it’s about ongoing formation. Fr. Chris said it’s a good reminder to all of his priests. Scot recapped the end of the Cardinal’s homily. Scot said it’s his sense that the Cardinal’s hope is that each parish will come alive and each Catholic will be motivated to share their faith. Fr. Chris said it’s an insight that originates with Pope Benedict XVI, who is always talking about this new evangelization, re-presenting the Gospel to those who have grown cold in the faith, re-introducing the idea that Christ is the life and the Resurrection. Scot previewed the liturgies of the rest of the week. He said beautiful images from these liturgies taken by George Martell can be found at http://www.flickr.com/bostoncatholic. Scot and Fr. Chris said the best way to prepare for Easter is to participate in all the liturgies and services of Holy Week. Fr. Chris reminded everyone that tomorrow night is the final light of The Light Is On For You for this Lent, where the sacrament of confession will be available in every church and chapel from 6:30-8pm.